Combining the traditional style of Santorini with the comforts of the high expectations of its guests, this property is a perfect luxury villa for providing a relaxed and at the same time enjoyable stay. Unbreakably tied with the typical island style design and the human aspect it is a place which is distinguished for the aesthetic quality and its function. 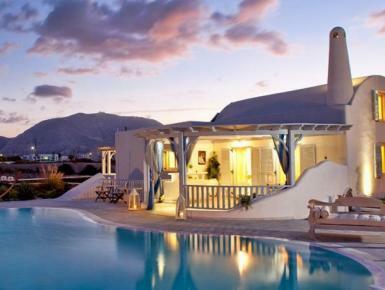 Is an Aegean vision of traditional Cycladic architecture and presents a magical blend of elegant white and azure. For discerning guests, the resulting elegance and high-end hospitality translate to an unforgettable vacation in the land of Myth and Sun.